Put the flour, eggs, oil, salt, sugar and milk into a bowl. Stir them with mixer until smooth. Add the sodawater and mix them again. The dough should be liquid. Let it stand for 30 minutes. Find a heavy pan, sprinkle with oil and heat it. Pan's diameter is about 18-20 cm. Pour 1 ladle dough in the pan, do circular motions with your hand so the dough covers the whole pan. Hungarian pancakes are very thin. Bake the pancake about 1-2 minutes, turn it around to other side and bake that 1-2 minutes again. Put the pancake on a plate and bake an other one step by step. Hungarians use a variety of fillings for pancakes. You can use different sauces too (vanilla, choco, fruits ...). 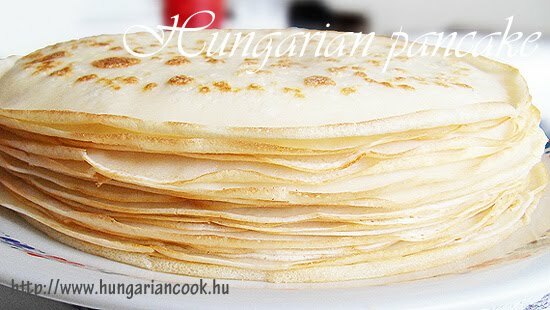 There are famous Hungarian pancake recipes, for example Gundel's pancake or Pancake of Hortobagy etc.